We would like to share good news with you. “Can Knockdown” our new and totally FREE project has been submitted and wait for Apple approval. Bellow game info and gameplay video. Feel free to write your comments. Thanks! Become a cold blood sniper while aiming at and knocking down piles and pyramids of cans! Start playing and you just won't put down this marvelous title till you drain your battery empty! You have been warned! Can Knockdown will include many astonishing features which will amaze your friends and make you come back for more! Online leaderboards via Game Center, absolutely gorgeous graphics, high-res Retina display support, unique and realistic physics engine, multipliers, explosive action and so much more! While we all wait on Apple approval for "Can Knockdown" please take a look on winter scenery we included in iOS version. Android fans should wait for next update to get this level. Game is live in the App Store! Don't waste your time just download the game and leave your opinion here. Thanks! Would you like to win hot promo codes for best iPhone and iPad games? 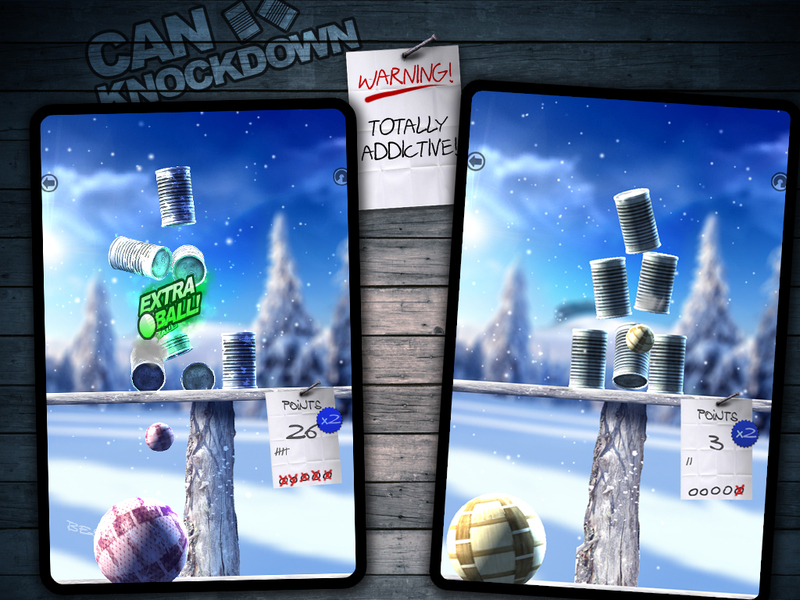 If so, please check our Can Knockdown contest on Touch Arcade forum. We need you! Please help us improve our games and win some nice prizes. Congrats with a great game! Been playing the free iPhone version for a bit now. However I spotted a bug which you could hopefully fix in the next release. Basically whats happening is that when I knock down all the cans and before it switches to the next level I press menu button and then select no a few times it skips the next few levels, increases my multiplier and gives me free balls. If I do this on every level I can easily get extra 20 balls + x10 multiplier and etc. Just thought I let u know as its a fun game and it would be interesting to farelly compete with the others online. Thank you for reporting that bug to us. We will try to resolve this issue asap. We hope you enjoy "Can Knockdown". Can Knockdown update coming soon for iOS devices. The new actualization will bring achievements for Game Center which we developed together with gamers community. Stay tuned for more info soon. 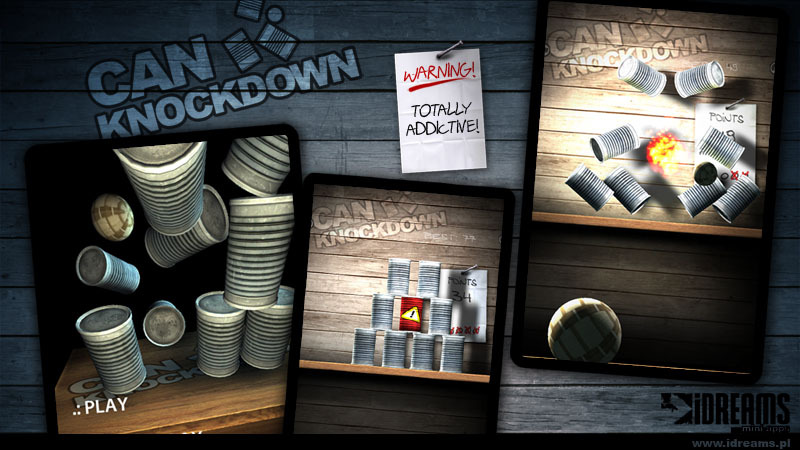 We have pleasure to announce the latest update for Can Knockdown brings optimization for iPad 2! I liked this one, it is like a folks games that converted into digital arcade. Yeah, completely agree with you!